Almost every business owner must be familiar with the benefits of having a website for their business by now. As we enter the second half of the year 2015 and come closer to the year 2016 there are also those who may be wondering about the fate of the World Wide Web. The worldwide Internet penetration has gone up from 6.7% in 2000 to 40.4% in 2014. The number of mobile internet users have leaped ahead of those from any other platform . The total number of websites has drastically gone up from approximately 17 million in the year 2000 to almost 1 billion in the year 2014. Thus, one thing is for sure a website is still an effective means to conduct business and it is likely to remain that way in the foreseeable future as well. This is the reason why there are now many firms all around the world that offer web development services. However it is necessary to careful while picking a development agency since not everybody gets it right. For example if you were to approach a development firm they are most likely to discuss about the website design and the functionality that you require. Then there are few who go a step further and also help develop the content for your website. However there will not be many website development firms prepared to discuss about the factors that are beneficial to the advancement of your business. For example they are unlikely to advice about how to form the content, the design elements that will help boost the website, or functionality that will be effective. Neither are they likely to discuss the topic of making your website more appealing and trustworthy. The design and development of a website do matter but that is only half the job since if it is not appealing or unable to win the trust of the visitors it will not be beneficial to the business owner. Thus this begs the question as to how can one assess the quality of the credibility of a website. A good credibility assessment makes it possible to measure various performance levels and more like accuracy, aesthetics, authority, professionalism, impartiality, current trend and even the popularity and quality. There have been several studies conducted on the issue of credibility assessment of a website over the years. However with each new year there are more advancements in technology that makes the previous studies redundant. Some of these studies did find that there is a close relation between the user preference for visual design and the credibility of an health related website. The importance of social networking has dramatically increased over the past few years to the level that not many had even imagined. For example the method in which the consumers and Internet users are now using Twitter for real time tweets during events, TV shows and many other has changed the face of digital marketing for good. Additionally such kind of actively when focused on a band or a product can have far reaching repercussions on the credibility of the business too. 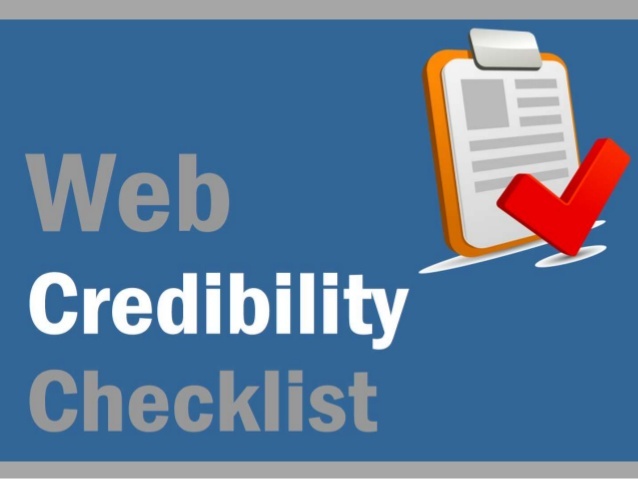 All these factors and more have led the experts to believe that the importance of web credibility assessment is now higher than ever. In addition to which it is also now harder to differentiate between authentic and fake information. Several scientific research conducted point to the fact that user often find it difficult to assess the credibility of a document when they lack the skills or ability to gather evidence from reliable source to support it. The checklist method is one of the more easier methods of assessing the credibility ofa website. There are two type though, those using humans and those using computers. It is possible to measure credibility based on certain set factors. These factors can vary and can also be customized as seem fit and largely depend on the domain and industry that is under the scanner. Here is a brief look at the most common categories that are likely to influence the credibility assessment. It is quite apparent that it is still important to have a website and it is also apparent that no every web development firm takes all factors into consideration when building a website. But this article provides a good insight into how the credibility of your website is very important and also helps prepare you to face the hurdles that come your way and even smoothen the process. There is a very popular quote from someone which goes like this, “Knowledge is power” which does appear to be very true indeed. As a business man if you are equipment with the knowledge of how to go about doing things you will be much better off. The website once designed also needs to be hosted, thus you will also require some server space. How to Work With New Features and Special Blocks in ZenCart?